A contemporary sketch of the landing ground at St Omer indicates just how crowded the airfield was in the autumn of 1914. The five RFC squadrons (together with their transport and tents) were deployed along the road (D198E) forming the northern edge of the plateau, with direct access to the large grassed area that formed the town racecourse. The supply column and transportable sheds were placed at the eastern end of the landing ground adjacent to the main St Omer to Abbeville road (D928) while the Aircraft Park set up on the opposite side of the road. Finally, the HQ Wireless Telegraphy Unit (later 9 Squadron) occupied the sandpit at the junction of the two roads. These dispositions provided the basis for the much larger site that would develop over the next four years. Up to this point the work of the RFC squadrons had largely comprised strategic reconnaissance. However, the role of aircraft in directing artillery fire was becoming increasingly important. For the First Battle of Ypres, all five RFC squadrons were actively involved (2 Squadron arrived at St Omer shortly before the battle opened on 19 October 1914, while 6 Squadron arrived on 21 October 1914) in artillery co-operation and tactical as well as strategic reconnaissance. During the course of the battle, although the bulk of the RFC remained at St Omer, detached flights from all the squadrons were deployed forward to work more closely with the individual BEF Corps. 6 Squadron achieved a notable success on 1 November when a two-seat Fokker of FA41 was forced down near St Omer and recovered to the Air Park for examination. By the time the German attack had been halted in November it was evident that it would be better if the RFC’s squadrons were permanently located closer to the front line. This move to a more decentralised organisation was formalised on 29 November 1914 with the creation of two separate Wings: No 1 Wing (comprising No 2 and 3 Squadron) under Lieutenant-Colonel H.M. Trenchard with its headquarters at Merville; and No 2 Wing (comprising No 5 and 6 Squadron) under Lieutenant C.J. Burke with its headquarters at St Omer. In reality, the squadrons had already moved forward, 6 Squadron to Bailleul (where the bulk of 5 Squadron had been operating since 23 October), 3 Squadron to Gouncham on 24 November and 2 Squadron to Merville on 27 November. This left just 4 Squadron and the Headquarters Wireless Telegraphy Unit at St Omer together with detached flights of No 2 and 5 Squadron. Although the airfield was now less crowded, the large size of the landing ground and the proximity to GHQ would ensure that it remained a focus for RFC activity for the remainder of the war. Unlike many airfields on the Western Front, St-Omer permitted a relatively long take-off run and unrestricted approaches for landing unless the wind was from the north or south. The site was also well served by the proximity to the town of St Omer with its workshops and billets, while it was only a short distance from the Channel ports from where men and materiel could be readily transported by road, rail or canal. The increasing importance of wireless telegraphy saw the formation of 9 Squadron from the HQ Wireless Telegraphy Unit on 8 December 1914. However, as is described in the accompanying article, the demand for wireless was such that flights from 9 Squadron were soon allocated to the individual Wings. In the event, 9 Squadron’s existence was destined to be brief – it’s success in developing wireless co-operation led to the decision to disband it in the field in February 1915. The wireless flights were absorbed by No 2, 5 and 6 Squadron and a new unit, 16 Squadron, created from the aircraft and personnel displaced by the ex-9 Squadron wireless flights. 16 Squadron, together with 4 Squadron, was formed into a new (Third) Wing, based at St Omer, under the command of Lieutenant-Colonel H.R.M. Brooke-Popham who led it until 26 May 1915 when he handed over to Lieutenant-Colonel J.F.A. Higgins, prior to succeeding Lieutenant-Colonel F.H. Sykes as GSO1 at HQ RFC. Shortly after its formation, Headquarters Third Wing hosted a dinner party at the chateau they occupied in Longuenesse, inviting the owners who were living in the town. Unfortunately, the evening became a gastronomic if not a social disaster when the Mess Sergeant and the other staff, under the excitement of the event, consumed more alcohol than was good for them – although the guests of honour seemed quite unperturbed by the events. The first months of 1915 were spent in a range of activities, including reconnaissance, bombing and photography as well as artillery spotting. Although poor weather limited operations, 4 Squadron was as active as possible attacking targets well behind German lines and losing both aircraft and pilots in the process. This included their CO Major G.H. Raleigh who was killed in a crash at Dunkirk on 20 January 1915 returning from a raid on Ostend. 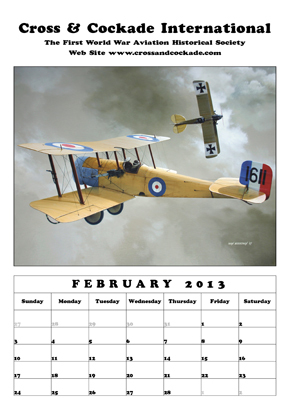 Although formed on 10 February, 16 Squadron’s first operational sortie – an escorted reconnaissance of German lines - did not occur until 26 February once their working-up period had been completed. The squadron’s period at St Omer turned out to be brief, moving to La Gorgue on 6 March to join the First Wing. Their place at St Omer was taken by 1 Squadron, equipped with Avro 504s and BE8s, who arrived from England on 7 March 1915. Spring 1915 saw the beginning of sustained air fighting as a series of offensives was mounted against the German frontline. The RFC was closely involved in supporting the attack against the village of Neuve Chapelle that opened on 10 March 1915 and, although the bulk of the air co-operation fell to the First Wing, the St Omer squadrons played an active role before the offensive ended on 12 March 1915. 1 and 4 Squadrons bombed railway junctions and bridges while 9 Squadron undertook artillery wireless co-operation. During a night bombing operation against Lille on 11 March 4 Squadron lost all three BE2bs involved, Captain R.J.F. Barton crashed on take-off while Lieutenant A.StJ.M. Warrand and Captain G.W. Mapplebeck were shot down over the target. Warrand was killed but Mapplebeck evaded capture and later escaped back to the UK through Holland. 1 Squadron had more luck on 12 March when Captain E. Ludlow-Hewitt led four BE8s in an attack with 20lb bombs against a railway bridge northeast of Douai and a junction at Don, only losing one aircraft. Towards the end of the month, however, the squadron suffered another loss when Second Lieutenant J.C. Joubert de la Ferte and Lieutenant D.M.V. Veitch were forced to land in Holland, both being interned. In the weeks that followed further squadrons arrived at St Omer to reinforce the RFC. 7 Squadron (RE5s and Vickers Fighters) on 8 April 1915 and 8 Squadron (BE2cs) on 15 April 1915. Both units were incorporated into the Third Wing, and employed on strategic reconnaissance work and special missions for GHQ – taking the places of 1 and 4 Squadrons whom both moved forward to the airfield at Bailleul. Shortly before 4 Squadron’s departure they scored a notable success, on 17 April 1915, when Captain R.M. Vaughan and Second Lieutenant J.F. 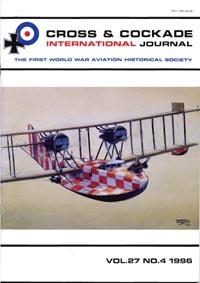 Lascelles in BE2c 1669 forced down a German aircraft in French lines. The new squadrons had arrived in time to participate in repelling the next German attack against Ypres, beginning on 22 April 1915. In order to interrupt the movement of German reserves, RE5s of 7 Squadron and BE2cs of 8 Squadron left St Omer on the afternoon of 26 April 1915 to bomb stations and trains in the Ypres salient. Similar attacks continued for the next four weeks until the German attacks ceased on 25 May. Even before the Second Battle of Ypres drew to a conclusion, a new Allied offensive had commenced on 9 May 1915 against Aubers Ridge and Festubert. Although the majority of the air support fell to the First Wing, 7 Squadron provided valuable intelligence throughout the battle. By now the Third Wing comprised No 1, 4 and 7 Squadron – 8 Squadron had joined the Second Wing at Abeele on 1 May 1915 – although only 7 Squadron was actually resident at St Omer (together with the Third Wing Headquarters). In the event the attack made little progress, the advance being impeded by a shortage of artillery ammunition and poor weather that limited the RFC’s contribution. By June 1915, therefore, there was just one resident squadron at St Omer. Although Headquarters Third Wing, following a reorganisation of the Third Army, relocated to Beauquesne on 20 July 1915, 7 Squadron remained behind as the GHQ squadron. This role had originally been undertaken by 4 Squadron until it was replaced by 7 Squadron in April 1915. Indeed, until 30 March 1916 when GHQ moved to Montreuil in anticipation of the Somme offensive, at least one RFC squadron was always based at St Omer for GHQ tasks, including defence against German air attack. The obvious strategic importance of St Omer meant that it was subject to increasing attacks by day and night as the war progressed. The first recorded incident was on 8 October 1914, the day that HQ RFC first arrived at St Omer. According to Maurice Baring the Germans dropped a bomb on the school shortly to be occupied by GHQ – indicating to some at least the miraculous divination of the German Secret Service! Thereafter, air raid warnings were a regular occurrence albeit that many proved to be false alarms. Particularly heavy raids were experienced in 1917 and 1918 that resulted in significant damage to the town and military installations as well as numerous civilian and military casualties. July 1915 saw the arrival of No 10 and 11 Squadron but neither was destined to spend more than a few days at St Omer before they flew on to their destination airfields. A further three squadrons would deploy in this fashion during 1915. This rose the next year to 16 before falling back to 11 in 1917 and a further 11 in 1918. In total, therefore, 43 squadrons deployed through St Omer in the course of the war, mostly for a matter of days but some for several weeks. 7 Squadron remained at St Omer until September 1915 and the opening of the Battle of Loos. The Western Front was relatively quiet during the intervening period and the squadron therefore found itself engaged largely in strategic reconnaissance. However, they also faced increasing German opposition to these activities. On 3 July, an RE5 was lost after a reconnaissance of Ghent and the crew interned in Holland, as was the crew of another RE5 on 21 July. Further combats were reported on 26 and 29 July with yet another crew shot down and interned in Holland. 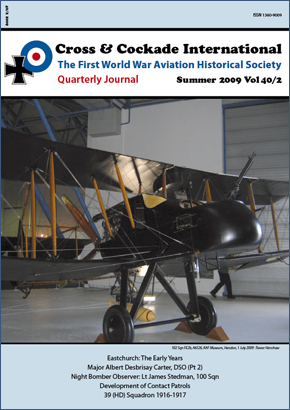 On 31 July 1915, an enemy two-seater attacked Captain J.A. Liddell and Second Lieutenant R.H. Peck flying RE5 2457 on a reconnaissance of Ostend. In the exchange of fire Captain Liddell was badly injured but rather than land in enemy territory he managed to fly the aircraft back to a Belgian airfield despite great pain and loss of blood. For his bravery John Liddell was awarded the Victoria Cross but died from his wounds a month later on 31 August 1915. 7 Squadron’s tenure at St Omer ended on 11 September 1915 when it was replaced by 12 Squadron, under the command of Major C.L.N. Newall, recently arrived from England and equipped with a mixture of BE2cs, RE5s and RE7s. Although there was still only operational squadron based at St Omer, the airfield remained extremely busy as the work of the depôt continued to expand. However, little if any permanent building had occurred and as one contemporary observer noted, the site was 'a rather untidy jumble of canvas hangars and sheds around the airfield'. Like its predecessor, 12 Squadron was largely employed on long-range reconnaissance tasks. An excellent account of this period (including the workings of GHQ RFC) is provided by Lieutenant R.R. Money who served as an observer throughout their time at St Omer. Shortly after the squadron’s arrival, it found itself heavily involved in the preparations for the Battle of Loos. The opening artillery bombardment commenced on 21 September, including special bombing operations conducted by the Second and Third Wings and 12 Squadron. These attacks were directed at trains on the move, especially in cuttings, and commenced on 23 September – two days before the infantry attack. 12 Squadron undertook three attacks on the opening day and participated in further attacks over the next five days. It was during one of these raids on 26 September that the squadron experienced its first casualty when Captain F.B. Binney in BE2c 1744 was forced to land behind German lines after bombing a train from 500ft. Further organised bombing attacks took place on 30 September and on 13 October to stem German counter-attacks before the fighting ended in the middle of the month. For the remainder of the year the squadron continued to undertake a mixture of defensive patrols and long-range reconnaissance, the latter against increasing opposition from German fighters. A Be2c was lost over Bruges on 19 December during a reconnaissance of Brussels, while a RE7 was shot down on a reconnaissance of Lille on 12 January 1916. Fortunately, no further aircraft were lost before the squadron left St Omer in February to join the newly formed 3rd Brigade. Other than 4 Squadron, 12 Squadron’s stay at St Omer would prove to be the longest of any flying unit. It was also significant for the events of 3 January 1916 when the bomb store on the aerodrome caught fire. The squadron CO, Major Cyril Newall, broke into the shed with his corporal driver to put out the fire – even though some of the incendiary bombs were already alight. They worked for 10 minutes alone and for an hour afterwards, Newall, a dirty and blackened figure, took the lead in rolling red-hot bombs out of harm’s way. For this action both individuals were decorated, Cyril Newall receiving the Albert Medal. The significant expansion of the RFC in France also saw the arrival of the first dedicated single-seat fighter squadron, 24 Squadron, on 7 February under the command of Major L.G. Hawker. The very next day the squadron undertook defensive patrols in protection of GHQ, even though they were still gaining flying experience on type. Unfortunately, they almost immediately lost one of their DH2 fighters in a flying accident at St Omer, the pilot Lieutenant E.A.C. Archer being killed, before their 12 DH2s left for their operational airfield at Bertangles. With the departure of 12 Squadron to Vert Galant on 28 February 1916, the GHQ role fell briefly to 25 Squadron and then 29 Squadron both recently arrived from England. As has been mentioned, 29 Squadron’s arrival was less than trouble-free and it would not be until 14 April that it could muster its full strength of 12 DH2s. The squadron’s first recorded air combat occurred on 2 April 1916 when Lieutenant G.S. Bush attacked a German two-seater over Ypres – but without effect. On 15 April 29 Squadron moved to Abeele and, thereafter, until the return to St Omer of 4 Squadron on 16 April 1918, the airfield did not host any operational squadrons – although it continued to provide a temporary home for squadrons newly arrived from England. These changes were presaged by HQ RFC’s departure for St Andre on 30 March 1916, in anticipation of the Somme offensive. The event was marked by the presentation of a silver cup to the chateau owners to commemorate the 18 months that they had played host to the Headquarters Staffs. Over the following months St Omer would become an increasingly active repair and supply depot. Although more than 30 squadrons would pass through the airfield over the next two years most only stayed a few days or weeks en-route to their front line airfields. For the immediate future, therefore, the airfield would be dominated by the activities of No 1 Aircraft Depot.